Brecht Van Lommel (brecht) accepted D4712: Fix for Outliner Draw Regression. William Reynish (billreynish) added a comment to D4736: Fix: Nav_bar context menu in preferences. And merge Context Menu keymaps to one.. Seems correct to me. @Campbell Barton (campbellbarton)? Brecht Van Lommel (brecht) closed D4679: Outliner Restriction Icon Opacity Inconsistency. Brecht Van Lommel (brecht) closed D4735: Info Editor description Updated. Brecht Van Lommel (brecht) closed T63859: Info Editor description outdated as Resolved by committing rBdeb9d03fc9d5: Fix T63859: outdated info editor description. Lack of outliner specific theme colors is still holding this back for me. Also would be good to ensure Blender Light still looks ok with this, and if not adjust it. William Reynish (billreynish) accepted D4650: For Discussion - Small Outliner Changes. This seems good to me with the latests updates. @Brecht Van Lommel (brecht) @Pablo Vazquez (pablovazquez) can you take a look too? Brecht Van Lommel (brecht) updated the task description for T57918: Left Click Select tweaks and fixes. Brecht Van Lommel (brecht) accepted D4735: Info Editor description Updated. @Andrzej Ambroz (jendrzych): not using the yellowish backdrop's colour for its outline, makes the backdrop look a kind of messy. Red Mser (RedMser) added a project to T63865: Animated Influence slider of NLA Strip doesn't update: User Interface. Red Mser (RedMser) added a project to T63864: Duplicate Data options don't exist for Light Probe and Grease Pencil: User Interface. William Reynish (billreynish) accepted D4735: Info Editor description Updated. EitanSomething created D4735: Info Editor description Updated. Dalai Felinto (dfelinto) closed T63526: Show parenting hierarchy in outliner view layer view as Resolved. RIght. There seems to be a bug spotted by @Sebastian Koenig (sebastian_k). But all in all this is implemented, yes. Brecht Van Lommel (brecht) requested changes to D4727: Limit value input range for color picker. RGB values outside the 0..1 are actually valid, limiting them is not the correct solution for this bug. For example a HDRI background can emit with arbitrarily high color values. Bruno Boaventura Scholl (brunobbs) updated the summary of D4727: Limit value input range for color picker. Bruno Boaventura Scholl (brunobbs) added a task to D4727: Limit value input range for color picker: T60577: 2.8 Color sampling alters color value. Brecht Van Lommel (brecht) edited projects for T63859: Info Editor description outdated, added: BF Blender; removed BF Blender: 2.8. Brecht Van Lommel (brecht) edited projects for T63860: Right-clicking navbar of User Preferences inconsistent, added: BF Blender; removed BF Blender: 2.8. Red Mser (RedMser) edited projects for T63860: Right-clicking navbar of User Preferences inconsistent, added: BF Blender: 2.8, User Interface; removed BF Blender. Red Mser (RedMser) edited projects for T63859: Info Editor description outdated, added: BF Blender: 2.8, User Interface; removed BF Blender. Brecht Van Lommel (brecht) added a comment to T63526: Show parenting hierarchy in outliner view layer view. @Dalai Felinto (dfelinto), I guess this task can be marked as resolved? EitanSomething added a comment to T57918: Left Click Select tweaks and fixes. Harley Acheson (harley) updated the diff for D4712: Fix for Outliner Draw Regression. @Brecht Van Lommel (brecht) : I think the correct solution would be to use te->directdata if it exists, and otherwise do the hash lookup. Harley Acheson (harley) abandoned D4713: UI: Small Input Status Line Changes. Actually, the more I look at this the more it looks deliberate. Bruno Boaventura Scholl (brunobbs) added a task to D4727: Limit value input range for color picker: T60619: Clicking away from colour picker wih hex value selected changes the colour. Bruno Boaventura Scholl (brunobbs) created D4727: Limit value input range for color picker. Campbell Barton (campbellbarton) closed T61554: Region Overlap: Input is blocked as Resolved. Campbell Barton (campbellbarton) closed T61554: Region Overlap: Input is blocked , a subtask of T56950: UI Paper Cuts (Parent Task), as Resolved. Alberto Velázquez (dcvertice) added a comment to D4721: Topbar/Tool Settings UI Layout Changes. Ian Crossan (lubeyrin) added a comment to T55194: Shortcut Keys Changed in 2.8x. ronan ducluzeau (zeauro) added a comment to T57208: 3D Cursor Tool Todo. Currently there is a problem with keymap of 3D Cursor. Left click to set 3D Cursor is conflicting with Left Tweak to move it using transform modal keymap. Sharan Ranjit (SharanRanjit) added a comment to T57746: In the Outliner, dragging across the disclosure triangles moves the item rather than open or close the items. Hey ! So I was going through this task and had a small doubt. How is this different from hide/show one level which is easily implemented by just numpad +/- ? Is there a necessity for this kind of shortcut? Brecht Van Lommel (brecht) closed T56702: Blender 2.8: Left Click Select as Archived. The bullet points from the original task description have been done, closing. Brecht Van Lommel (brecht) closed T56702: Blender 2.8: Left Click Select, a subtask of T57917: Keymaps (Parent Task), as Archived. Paul Kotelevets (1D_Inc) added a comment to T56702: Blender 2.8: Left Click Select. 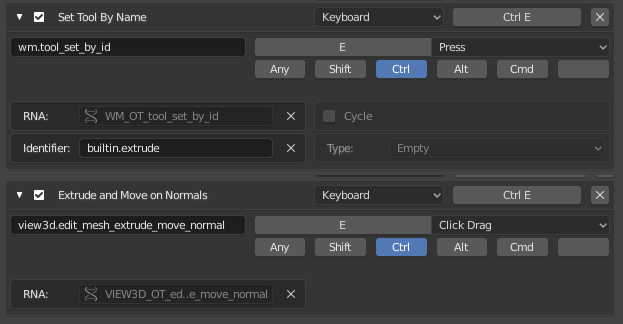 Alt+LMB for view manipulation works in Blender currently when Emulate 3 Button Mouse is enabled in the Preferences. This is useful for users who don't have a 3-button mouse, and more importantly, many modern mice have unfomfortable scroll wheels that are not nice to click. Alt+LMB has always been an alternative, it just happened to not work for LMB select. We should fix that. Hans Goudey (HooglyBoogly) updated the diff for D4706: Object alignment dropdown in generic object_add properties. Changed "Input" to "Custom" like Pablo suggested. I found a few other examples of that term used in the UI, it's definitely better. Applies to latest master.